Diamond Fork River is located up Spanish Fork Canyon in South Utah County, and flows into the Spanish Fork River in Spanish Fork Canyon. 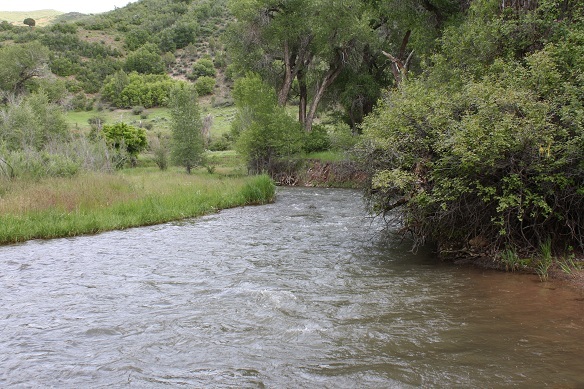 Diamond Fork is well-known with many local fishermen as a fantastic place to flyfish for nice sized Brown Trout as well as the occasional native Cutthroat Trout. Be very careful when wading this stream while flyfishing, because the rocks are usually coated with a very slick type of algae that can make wading a difficult if not dangerous undertaking. Boots with felt soles and/or studs in them will make wading a lot easier. There are a couple of campgrounds up Diamond Fork where you can pay to camp if you wish, or you can camp for free in some of the higher reaches in many pullouts, fields, etc. NOTE: Much of the upper portion of Diamond Fork was treated with rotenone in 2006 to remove brown trout so that native Bonneville Cutthroat Trout could be reestablised in the stream. Please read about the treatment for the full story. In addition to flyfishing, small spinners cast with spinning gear can also be very successful on this trout stream. Take I-15 to Spanish Fork. Head Southeast up Spanish Fork Canyon on Hwy 6 for approximately 12 miles. Turn left (Northeast) at the Diamond Fork Turnoff. The road parallels the river for miles. Elk-hair caddis nymphs are very popular and productive for Brown Trout when flyfishing. If using lures, try small spinners or rapalas cast upstream and retrieved down through holes.